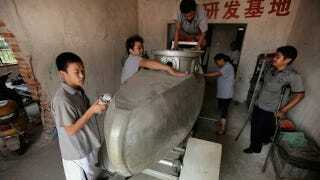 Would you trust a homemade submarine made by some guy who was laid off of his factory job in China? Maybe not. But don't you think a $30,000 functional mini submarine is totally worth it? Yes! Screw a new car, buy a submarine! It's truly impressive, what logic points a man who was laid off towards a new career in submarine making? How did this man, a Chinese worker in Wuhan, China, manage to cull together $400,000 to start a 10-man workshop to make $30,000 submarines? It's a freaking submarine, for god's sake! You can't just make them. Who does this? What's amazing is that his first few models sank yet he still kept working at it and people kept supporting him.